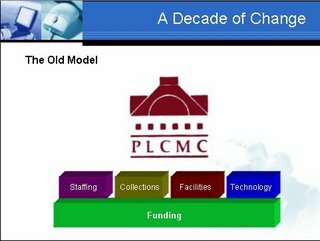 The title of Roy Tennet’s recent post on TechEssence, A Technology is Not a Service, (good article BTW) reminded me of two presentation slides I have used often to talk about how the role of technology has changed within libraries. Under the old model (which unfortunately I think so many libraries still subscribe to), technology is viewed as one of the four pillars of library service. The problem with this approach is that the funding of technology is often seen as a “service” competing with your book budget, staffing dollars and facilities/operations funding, when the reality of it all is that technology doesn’t stand alone as a parallel silo. 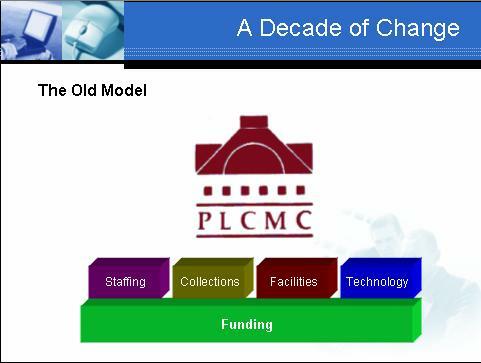 But rather that technology has become part of the larger foundation that supports all areas of library service. Because of the implementation, support and use of technology, our staffs are more skilled and highly trained. And when the network goes down or there is a strain in the infrastructure backbone, it cripples our ability to provide full services. Because of the use of technology, our collections are accessible to more people (from home, work or anywhere), our materials move faster to and from the patrons hands and we are better able to develop exciting and diverse collections to meet our growing public’s demand and need. Because of the use of new technologies, our buildings and facilities are better managed, smarter in design to deliver services and capable of adapting more easily to service level changes. … if you lost email communications for week because your server crashed and hadn’t been upgraded in 5 years? … if all your access to electronic databases and the internet went down for a week because your network (built on a fragile spider web of routers, switches and equipment) failed and was as old as that first PC -- remember those PCs that booted from 5 1/4” floppies and had 10 mb hard drives – your library installed? … if access to your online catalog evaporated along with a nasty virus attack that rendered your database useable? … if you had no way to check-in or scan returned materials so you could get them back on the shelves or forwarded to the next patron in line? The truth is technology is core to nearly everything we do, from checking out books and materials to answering simple reference questions; to communication with our staffs and public; to providing access to our buildings and facilities; and most especially, to our core services. I agree with Roy... Technology is NOT a service. Technology IS an ever-evolving FOUNDATION. It also helps if you have a light above the aquarium so the public can see the fish (marketing). Okay, I could go on like this all day. Enough already.